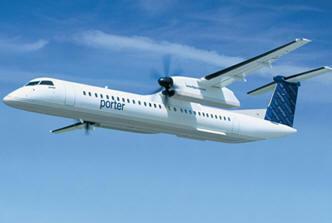 March 25, 2012 - In mid-April, Porter Airlines plans to use one of its Bombardier Q400 turboprop airliners to conduct the first biofuel powered revenue flight in Canada. "We are timing our biofuel powered flight close to Earth Day to emphasize the contribution that biofuels are expected to make in helping the aviation industry meet its targeted reduction in emissions," said Robert Deluce, President and Chief Executive Officer, Porter Airlines. "Q400 and Q400 NextGen aircraft are already among the 'greenest' aircraft in the world and the use of biofuel will make the aircraft even more environmentally conscious." Porter's biofuel-powered revenue flight will utilize a 50/50 blend of biofuel with Jet A1 fuel. The biofuel portion is derived from the oilseed crop, Camelina sativa* (49 per cent) and Brassica carinata (one per cent). The Q400 turboprop airliner, which is built at Bombardier's Toronto, Ontario facility, is the advanced successor to Bombardier's Dash 8/Q-Series family of aircraft. Optimized for short-haul operations, the "comfortably greener," 70- to 80-seat Q400 aircraft is a large, fast, quiet and fuel-efficient turboprop. It provides an ideal balance of passenger comfort and operating economics with a reduced environmental footprint. Setting new environmental standards, the Q400 aircraft uses 30 to 40 per cent less fuel and produces 30 to 40 per cent fewer emissions on routes where it has replaced similar-capacity, older jets. Overall, the Q400 aircraft is 15 decibels quieter than ICAO Chapter 4 noise standards; raising the bar for the entire industry. More than 380 Q400 aircraft are in service with approximately 40 operators in 30 countries, on six continents. These aircraft have transported more than 177 million passengers. Founded in 2006, Porter Airlines has revolutionized short-haul flying with a warm and effortless approach to hospitality and restoring glamour and refinement to air travel. An Official 4 Star Airline in the World Airline Star Rating by Skytrax, and rated second in the world in Cond? Nast Traveler's Readers Choice Awards Top Small Airlines category, Porter is committed to providing a premium travel experience. Complimentary amenities include luxurious airport lounges, Starbucks coffee, premium snacks, and wine or beer onboard. The airline currently offers flights to Toronto, Ottawa, Montr?al, Qu?bec City, Moncton, Halifax, St. John's, Thunder Bay, Sault Ste. Marie, Sudbury, Timmins, Windsor, New York (Newark), Chicago (Midway), Boston (Logan), Washington, D.C., and has seasonal flights to Mt. Tremblant, Que., Myrtle Beach, S.C., and Burlington, Vt.
GARDN - the Green Aviation Research and Development Network is a business-led Network of Centres of Excellence. Its mission is to promote aerospace technologies aimed at the protection of the environment. The seven themes of research targeted by GARDN are: noise and source emissions reduction, materials and manufacturing processes, airport and aircraft operations, alternative fuels and product lifecycle management. GARDN's activities are in support of the competitive excellence of Canadian aerospace products and services, the economic success of the member companies as well as the development and training of highly qualified personnel.